Mr Eazi performing at Coachella. Afropop sensation, Tosin Ajibade aka Mr Eazi had the crowd swaying to his debut performance at Coachella on Saturday night. The Coachella Valley Music and Arts Festival is an annual music and arts festival held at the Empire Polo club in Indio, California. It is one of the most famous, and profitable music festivals in the United States and all over the world. Burna Boy is billed to perform on Sunday night. The 'I surrender' singer thrilled the audience with medleys of his hits beginning with 'Skin Tight' which they gleefully sang along. 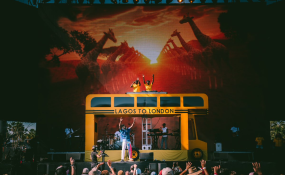 Mr Eazi energetically jumped around the beautifully designed set which housed a life sized bus with Lagos to London (the name and art of his newest album) inscribed on it. Mr Eazi is known for pioneering Banku music, a sound characterised by percolating rhythms and laid-back vocal delivered in Ghanaian Pidgin English. NAN reports that 'Lagos to London', his third project, was released in November, 2018 following the release of 'About to Blow' in 2013 and 'Life is Eazi: Vol 1 - Accra to Lagos' in 2017. According to Mr Eazi, 'Lagos to London' takes listeners on a full journey from life in Lagos, Nigeria with the vibes and intricacies to understanding the groove of life in London; two cities he frequents.